Basilisk is located inside The Zipper food court (at NE 27th and Sandy Blvd) in Portland, Oregon. 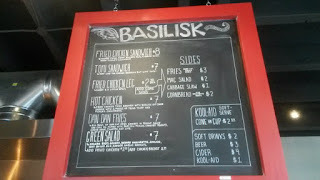 After trying his hand at Sideshow Eatery and Rua (in food cart form downtown and as a brick-and-mortar at the very same Zipper location), Jason turns to Basilisk as his next creation. The name comes from a legendary serpent born from a chicken's egg, so perhaps a yearning to dish out kickass (and possibly monstrous) chicken dishes. 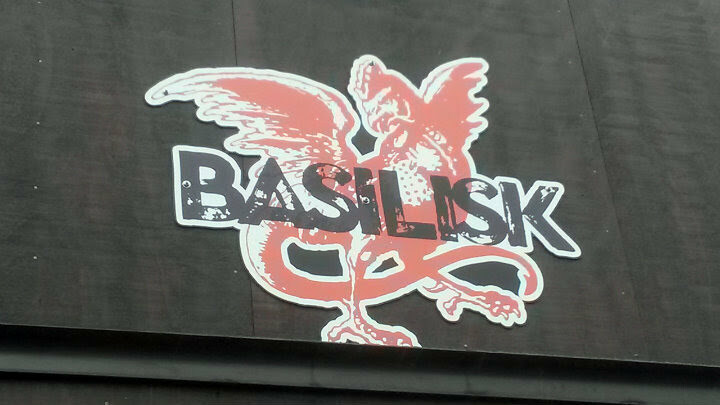 I admittedly only got wind of this restaurant after reading a favorable Willamette Week article on Basilisk. 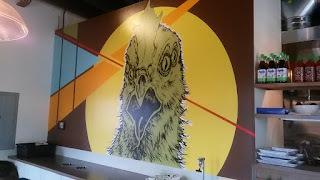 From my experience there in mid-May, Jason was still reaping the rewards from that article; his flagship Fried Chicken Sandwich ($8) was already nearly sold out after the lunch rush, and in fact would sell out while I was still there. 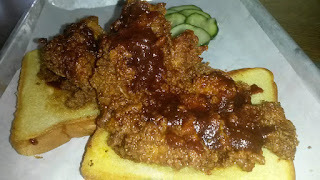 Being the spicy panda, I ordered the Hot Chicken Sandwich ($7), their fried chicken topped with their top-secret Basilisk spicy sauce and put on Texas toast. 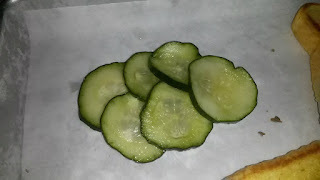 The sandwich comes with a side of house pickled cucumbers. The fried chicken here is amazing, some of the best in the city, in my book. 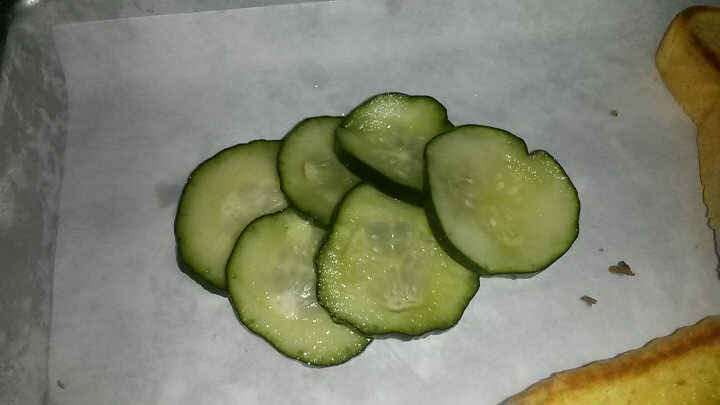 It's not greasy, while retaining amazing juiciness. The chicken is marinated, dipped in buttermilk, and given a coat of an all-purpose flour and potato starch mix. It's not too bready and retains a pleasing crunch. 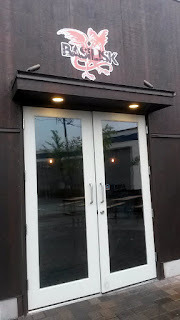 The sauce has a peppery, slightly sweet, and garlicky kick, with a noticeable spice - which generally means it will have some punch for the general public. 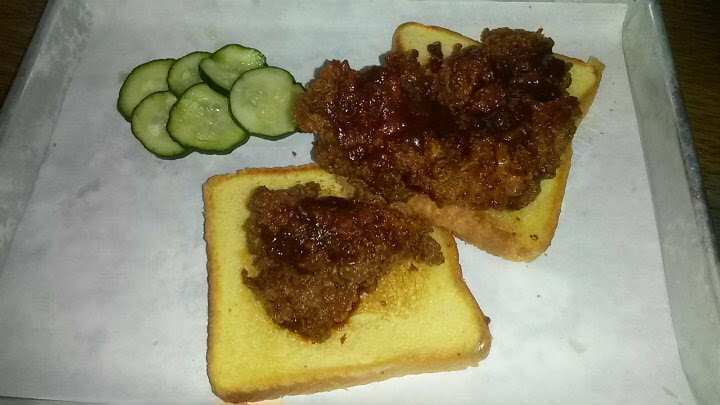 Overall, this is a heck of a dish and one that this place should be truly proud of. 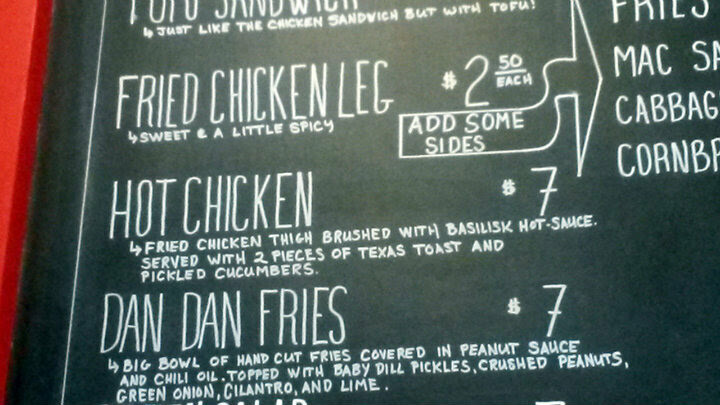 I saw the house Fried Chicken Sandwich before it sold out, and it really brings the protein. 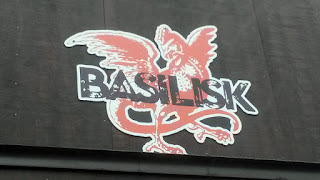 Certainly makes the Basilisk name an appropriate fit. 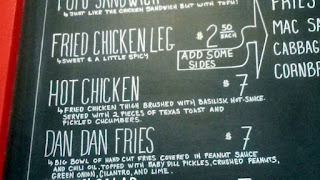 If you want your carbs here, the Dan Dan Fries ($6) will provide you a big bowl of spuds with a Southeast Asian flare. Peanut sauce and crushed peanuts, lime, cilantro, green onion, baby dill pickles, and chile oil.